Gentle Complexion is a blend of all things beneficial for your skin. 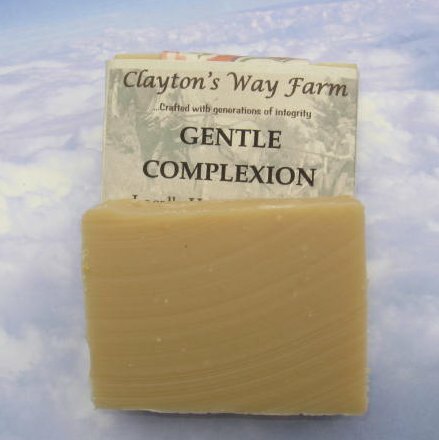 It is gentle enough for those with sensitive skin, and can be used as a daily face soap, or baby soap. Jojoba, one of the best all around natural oils that is a liquid wax, mixes naturally with our skin's fluids because it closely resembles human sebum, the skin's natural restorative fluid. Helps make skin soft and silky, and is excellent for inflamed skin, acne, dandruff, eczema & psoriasis. Reputed to be a natural wrinkle remover. Ingredients: Saponified olive, coconut, pal, and castor oils. Goats' milk, jojoba oil; lavender essential oil.